One moment, you are nagging urging your toddler to get more independent, the next moment you are left wondering when exactly was that moment when he/she grew up so much...motherhood is a long journey speckled with such tales. This is one such story. One that left me awe-struck and proud that my daughter, who refuses to fix herself a bowl of cereal, could independently bake a cake. My daughter, like me, loves the process of baking. Her eyes fill with wonder as she sees the ingredients added in, one after another, to make a batter that then rises to make a cake or bread, the aroma enveloping the entire house. "Wow, look at that', she exclaims when she sees the final product pulled out of the oven. I bake a lot with her just so I can rejoice with her in her sense of wonder. She has been my most trusted little helper in the kitchen, mixing in the ingredients as I measure them out. One day, during her 2 month long vacation, she decided she wanted to bake a cake all by herself. She wanted to follow a recipe, she said, and bake a cake. Without any help from me. I was skeptical, she was determined. We tried a couple of recipes, ones that didn't involve any creaming of butter and sugar, but she would get hassled at the use of multiple measuring cups... 1 1/3 cup of sugar, 2/3 cups of water, 2/3 cups + 2tbsps of oil...you get the picture. Clearly, we needed a recipe that made measuring the ingredients...well, child's play. Looking up child friendly baking recipes on Google led me to the French Yogurt Cake. 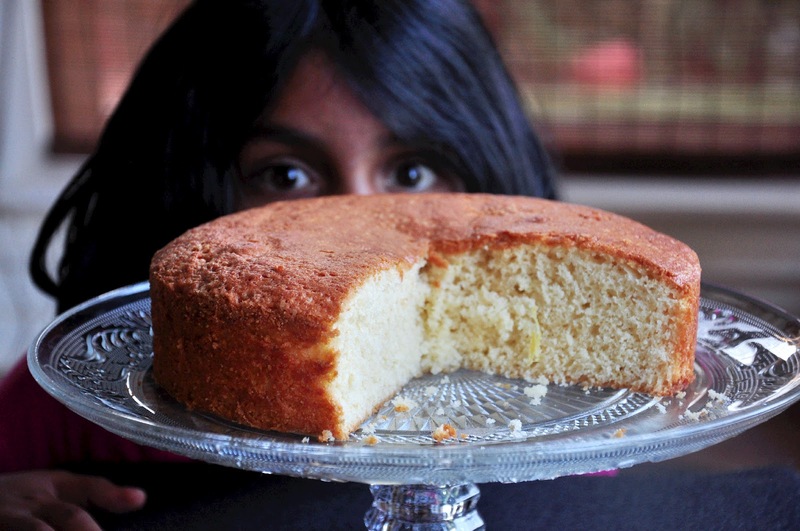 Apparently, the French Yogurt Cake is one that French kids learn to bake at a very young age because it is so easy to make. Type French Yogurt Cake into your search engine and you will be flooded with recipes. I wanted one with a yogurt pot measure and ended up using this recipe as a guideline. *You can use a yogurt pot of any volume...100 gms, 125 gms, 150 gms. Given the 1:2:3 ratio of yogurt, sugar, and flour, the quantity of sugar and flour will proportionately increase. Ensure that the weight of the eggs is equal to that of the yogurt. Also, you will need to increase the baking powder; for this cake, you will need to use 3/4 tsp per 50 gm egg. Sieve together the flour, salt and baking powder 3 times. Lightly beat the eggs with a fork. Add the sugar to the eggs and mix it in. To this, add the yogurt and the vanilla essence. Next, pour the oil in a thin stream. Finally, fold in the flour in 3 quick additions. Add the lime zest, if using. Grease and line a 8" cake pan or a loaf pan and bake at 180 deg C or 350 deg F for about 30-35 mins, or until a skewer inserted in the centre of the cake comes out clean. (I draw the line at measuring the ingredients, making the batter and pouring it into the pan. When it is time to handle the oven, I make sure that I am around). This is delightfully soft cake and is perfect with a cup of tea or coffee. I savour every bite, not because it is a nice cake, but because of the little hands that make it! Try making this with your toddler and revel in their sense of accomplishment. Worth every single crumb, I promise. Kids are wonderful when they are independent but we need to watch and cleanup after them.lovely bake!lloved ur lil one's exclamation looking at the cake coming out of the oven. Lovely post. Would love to make that delicious cake with my toddler, but it might be a little difficult to coerce him to make a cake, so I'll make it myself. Love the first picture with ur little one playing peek-a-boo with the camera. Ah, what a beautiful looking cake! Many congrats to your daughter and you! I can;t wait to bake with my kiddo! This is a wonderful snack cake, your daughter must be super happy! Love this yogurt cake very much, kids are wonderful na, kudos to ur lil darling. It is not just about the ingredients or the recipe, good food happens when it is served with love! !